1) Once a booking by a customer has been accepted either verbally, in person, over the telephone or in writing, cancellation of the agreed joining instructions by a customer 10 working days or more prior to the commencement of the course date will incur an administration charge of 25% excluding VAT. Cancellation within 10 working days by a customer prior to the course date will result in the whole course fee being CHARGED unless superseded by a variation to conditions of business specified for a particular training course i.e. Driver Training, CPC & ADR, Forklift truck, Driver CPC. Substitution of course delegates will be accepted upon reasonable notice being given and the original joining instructions and fee will be deemed to be acceptable. All cancellations must be in writing, verbal cancellations are not acceptable and proof of posting is advisable. It is the responsibility of the customer to ensure that an Order Number with instructions is issued in writing if it is required by the customer to be included in any future invoices or correspondence for services provided by Essex Transport Training. Where a verbal order has been accepted by Essex Transport Training it will be deemed that the standard Terms & Conditions apply for the service being provided without variation at a later date, unless agreed in writing by Essex Transport Training as a variation to contract. 2) Payment of all course fees must be made prior to the commencement of the course unless other arrangements have been mutually agreed with Essex Transport Training, Cheques accompanying booking should be made payable to Essex Transport Training, we reserve the right through non-payment by the customer prior to the course to cancel the joining instructions and offer the place elsewhere. Where a customer has paid a deposit, the full balance is due payable 10 working days prior to the course commencing. Unless other arrangements have been made, failure to pay the balance could result in the course being cancelled and the full charges being incurred. 3) Any variation to the joining instructions, course dates, time of attendance etc, made by Essex Transport Training will be notified to the customer. Essex Transport Training will make every effort to ensure the original instructions are complied with. In the event of course / delegate cancellation made by Essex Transport Training every endeavour will be made for the delegate to attend the next available course. All incidents and actions including any money refunds are dealt with promptly and fairly in compliance with the company’s quality processes. 4) Every effort is made to ensure that both the instruction, hand-outs, course notes given are true and correct at the time but Essex Transport Training does not accept any responsibility for error or omissions. Any delegates attending Essex Transport Training premises including vehicles are required to adhere to any notices or instructions given to them by Essex Transport Training staff. Essex Transport Training does not accept any responsibility for personal belongings or vehicles left on the premises. 6) Unless specified arrangements are made for course refreshments by Essex Transport Training refreshments during the course will be the delegate’s responsibility. 1. Where external examinations are involved and the delegate for enrolment has supplied details, Essex Transport Training cannot accept any responsibility for the accuracy if a dispute should arise with the examinations body. 1. It is important that adequate provision is made to ensure that drivers attending courses are able to comply with the rest requirements laid down in the Driver Hours Regulations. 2. Special needs, the company will endeavour to provide training wherever and whenever practical to do so having first accessed the applicants capability to receive instruction which does not compromise the Health & Safety of it’s workforce, the general public and the individual themselves. For a person who falls into the category of requiring special needs, the company’s normal standard tariff quoted in its Course Guide does not apply and each request will be priced on an individual basis and subject to whatever is recommended at time against the need. The company retains the right to refuse to train any person who in it’s professional belief will not be able to reach the required standards of that prescribed by either the HSE or the DSA having firstly assessed the person. 3. Should a Customer recruit an instructor into their full or part-time time employment following any training provided to the customer by the Company or approach the instructor about engagement whilst they are still in the employment of the Company under the terms of this Agreement of or within three months of the instructor leaving the employment of the Company whether as a result of the instructors own application or following a job offer by the hiring company, the Customer undertakes to notify the Company forthwith of such engagement and to pay a minimum placement charge of £5000 plus Vat, together with such extra charges as the Company may specify in relation to any specialised job training undertaken by that instructor within the 12 months immediately proceeding the date of the Customers engagement of such instructor. All such charges are due payable within 14 days of receipt of the Company’s invoice for such recruitment. 4. Should the course be held at the customers own site the room provided must be fit for purpose. If the instructor feels that the premises are not adequate then he may cancel the course at full charge. The above terms and conditions are binding on acceptance of the joining instructions and supersede any terms and conditions that the customer may wish to impose, no variation may be made without the specific signed agreement with the management of Essex Transport Training. 1. No estimate or assessment of training time required by a driver to reach LGV/PCV/Car test standard may be considered to be in any way a guarantee that a driver will pass the test at the end of the suggested training time. 2. A training day is normally 7 hours on a dual basis or 3 1/2 hours during solo training. For the health and safety of both the instructor, trainee and other road users there will be a total of 15 min break normally taking during the day. 3. Unless an account facility has been pre-arranged and fully cleared, all training must be paid for prior to the course starting. Any extra training booked during a course must be paid for before the test date. Essex Transport Training Terms for Payment supersede any conditions applied by the customer under their own terms of purchase, unless previously agreed in writing before training has been provided. The customer shall make payments of all sums due to the Company within 30 days of the date to which invoices are submitted by the Company and interest will be charged at 10% above Lloyds Bank plc base rate on accounts, which are not paid within that time). 4. No allowance can be made for non-attendance of a driver booked on a test or course unless 15 working days notice of cancellation has been received prior to when the course is scheduled to start. Customers are advised that when returning a cancellation notices that they use Royal Mails Special Delivery obtaining a proof of posting receipt. Failure to be able prove posting within the prescribed timescale above, may result in a charge for all or part of the course being made dependant upon all or part of the cancelled course being sold. 5. Our prime concern throughout all training given by the company must be to provide the highest possible standard of road safety for the protection of our customers, the public and our staff. In the unlikely event that a driver is found by the third day of the course to be unsuited to further training and unlikely to reach test standard, the driver will be told that they will be unable to take their DSA Test due to safety reasons. 6. If the initial stage of training is satisfactorily completed, but our subsequent internal assessment tests reveal that a driver has made insufficient progress to safely attempt the test we must, in the interests of road safety, reserve the right to cancel the use of our vehicle for that test. In the event of such cancellation the company will refund the cost of the accompany to test charge only, the test fee being forfeited unless recoverable from the DSA. The company cannot accept liability for any loss caused by such cancellation. 8. Our vehicles are all fitted with internal/external cameras and microphones, all training is conducted professionally and diligently to enhance the trainees chances of passing his/her test. Trainees have seven (7) days post course in order to submit any complaints. All complaints are dealt with seriously by Essex Transport Training. All recordings are maintained on the company database for 3 months after any course. 9. Aggressive or threatening behaviour is not tolerated by Essex Transport Training and any customer partaking in such will have their course cancelled and will not be able to ask for a refund. 10. All course bookings (practic driving, CPC, Hazard perception and theory) that are altered and or changed will come at a small administration fee to the booker, please bear this in mind when you are thinking of amending a booking if it is not required. 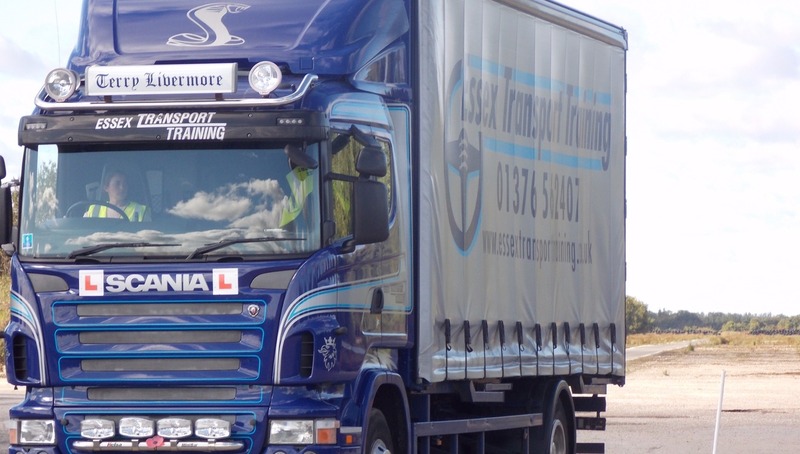 Essex Transport Training is proud of being successful since 1986 with thousands of satisfied Companies and individuals alike. We can provide references on request from most if not all of our customers. Essex Transport Training boasts a proven high pass rate, which has remained consistent over many years of business. We always strive to give you the customer excellence in the training we provide. 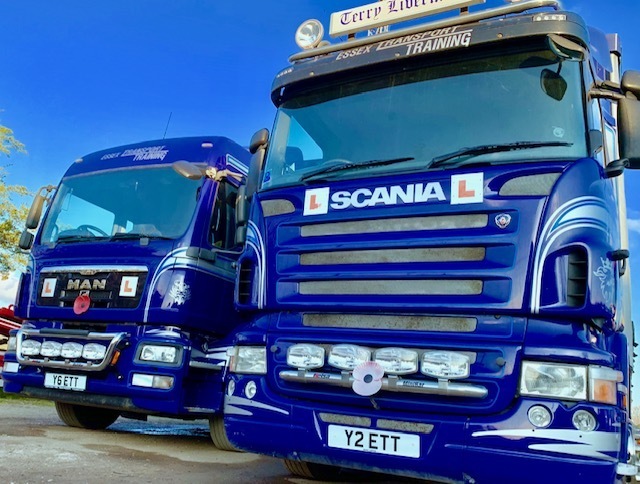 Essex Transport Training provides all vehicles for training in first class condition, with multi change gear boxes and curtain side box trailers, which represent todays Transport and Fleet Operations. Our Instructors have the experience to judge the qualities of drivers on assessments, so to ensure hard earned money is not wasted. Courses are tailored to suit each persons needs, leading to a successful conclusion in both time and money.